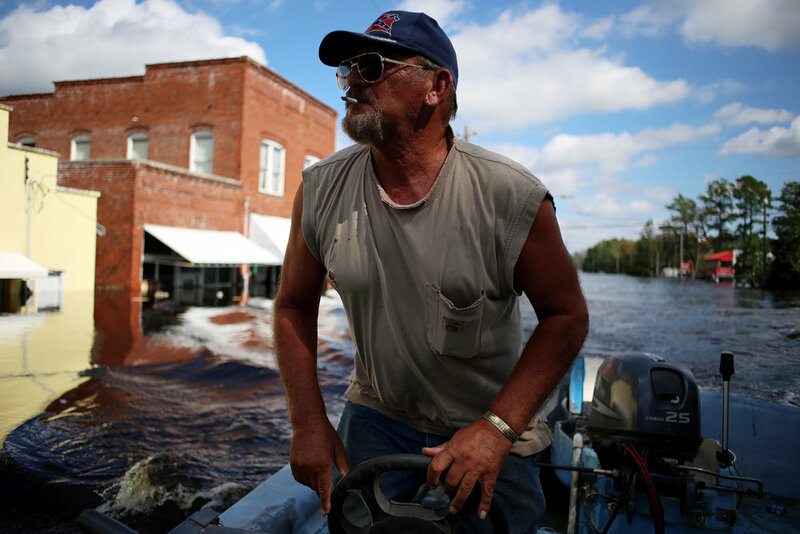 Donald Jones, of New Bern, guns his boat down Main Street, which was flooded by the nearby Trent River, Sept. 18, in Pollocksville, N.C. Jones was helping deliver food and water for Kim Arthur, whose home was in an area largely cut off from outside resources. "I'm about 10 minutes out in the country and this is the only way to get to town," she said. 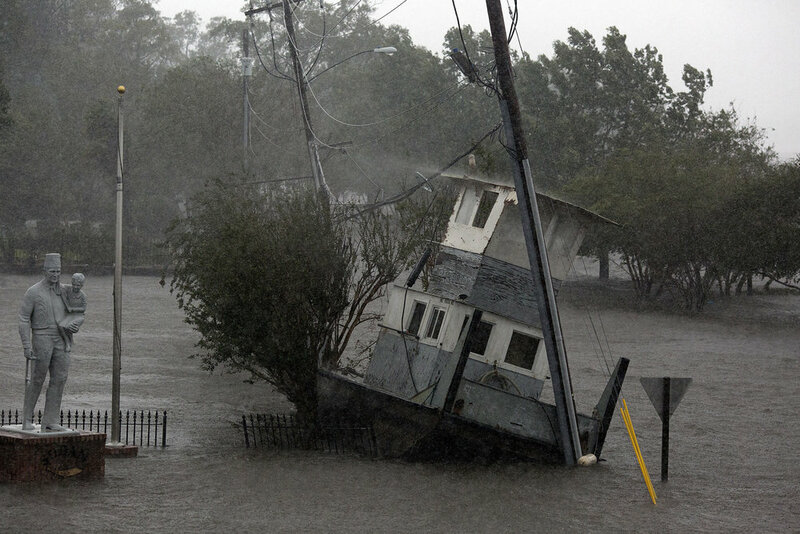 A tugboat, pushed ashore from the nearby Neuse River by the storm surge, is seen Sept. 14 in downtown New Bern, N.C. as rain continued to fall. Buster Radford, 77, walks near his home, Sept. 15 in New Bern, N.C.
Members of the North Carolina National Guard and New Bern Police Department rescue a tactical vehicle stuck in floodwaters during night operations, Sept. 14 in New Bern, N.C.
Allana Bailey, of Hubert, plays with her daughter, Brooklynn Lowe, 3, outside of the Holiday Inn Express as Hurricane Florence rolled in, Sept. 13 in Jacksonville, N.C. "They're tired of being cooped up in the room -- but they've got a pocketful of energy," Bailey said of her twin daughters, who she calls 'twinados'. Tyrese Jordan, 11, looks back toward a dry section of roadway, Sept. 17, 2018, on Highway 41 in Trenton, N.C., as he waited for Russell Jordan to return from their flooded home. They were attempting to evacuate their family's dog, which was stuck on sliver of dry land, but the water was too high near their home. 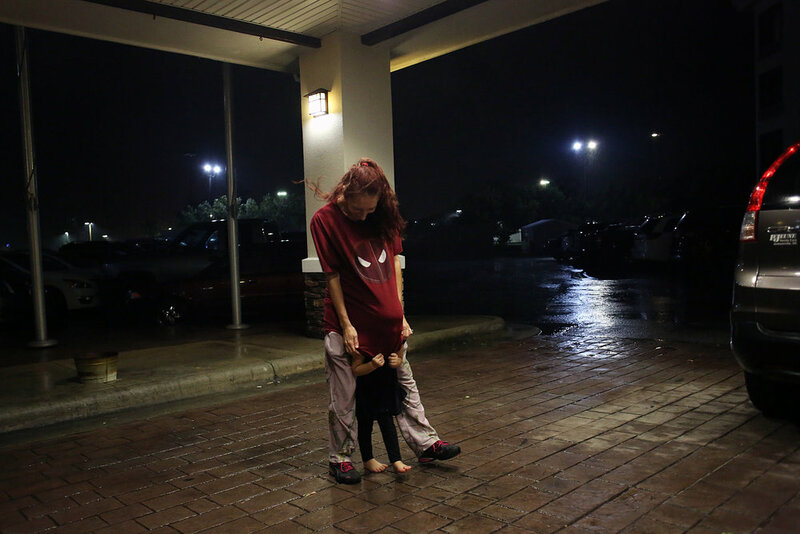 After evacuating their home, the family was bounced to several different shelters, with each one progressively further from home. 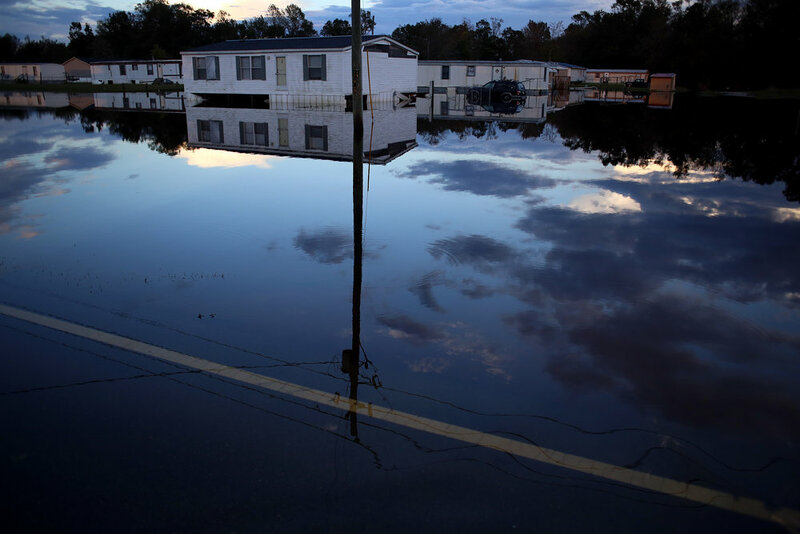 A structure flooded by the nearby Trent River is seen Sept. 18, 2018, in Pollocksville, N.C.
A member of North Carolina Task Force 10 looks out at floodwaters from the back of a national guard LMTV as a mixed unit of guardsmen and rescue personnel conducted welfare checks, Sept. 15 in New Bern, N.C.
Cleo Jones, 85, embraces Annette Jones Kennedy outside his flooded home on Simmons Street as she shows him photos of her own flooded home, Sept. 15 in New Bern, N.C.
Spc. Craig Needham, of the North Carolina National Guard, directs a forklift as it offloads pallets of water, Sept. 17, 2018, at Temple Baptist Church in New Bern, N.C.
Allen Chapman, 71, Fannie Chapman, 72, and their granddaughter, Maryah Chapman, 7, walk down Highway 41 after viewing their flooded home, Sept. 18, in Trenton, N.C. "We've been here 51 years on this street," Fannie said. "This is our first time back since it happened. It flooded in '99, but not like this. It's gone again." Allen Chapman vowed to persevere, but wasn't confident in FEMA's disaster assistance, and wondered how people were even able to pay for flood insurance. "Out here, we're low on the totem pole," he said. "It ain't gonna happen overnight." The water was too deep for Allen to make it into his home, but he know it was a total loss. "You're looking at what I got," he said. The family evacuated to Raleigh for the storm. Night falls on Highway 41 as flooding from the nearby Musselshell Creek -- a tributary of the Trent River -- persists, Sept. 18, in Trenton, N.C.